Could Dunder Casino be the hottest new casino right now? A big bonus, an even bigger game selection and an awesome casino experience summarizes this casino. We love new casinos and it was a no-brainer for us to test every aspect of this super casino. We use the word super casino as we are convinced that Dunder will be appreciated and welcomed with open arms as by casino lovers all over the world. We find proof of this when looking at the creators, as Dunder Casino is owned by the same people who run Casumo. Casino Wings had the chance to test the new Dunder Casino before launch, and we have a lot of things to bring up. Our first spontaneous thought is that Dunder offers an incredibly cosy game experience, where everything feels well-thought-out and luxurious. Dunder is located on the iGaming Cloud platform and boasts a wide selection of games. There are multiple interesting categories for the games at Dunder, which makes it easier for you to find new games with a theme you are already a big fan of. We've always been huge fans of Casumo and we've been following the development of Dunder for months before it launched. That's why this Dunder Casino review is one of the most meticulous ones out there. On the 5th of March 2016, Dunder started the beta testing of their new casino. On the 8th of March, it was launched for the public and has been incredibly popular ever since. Sounds good, right? At Dunder, you’ll get 20 free spins in Starburst just by opening an account. That’s the kind of spirit we love with this new casino. 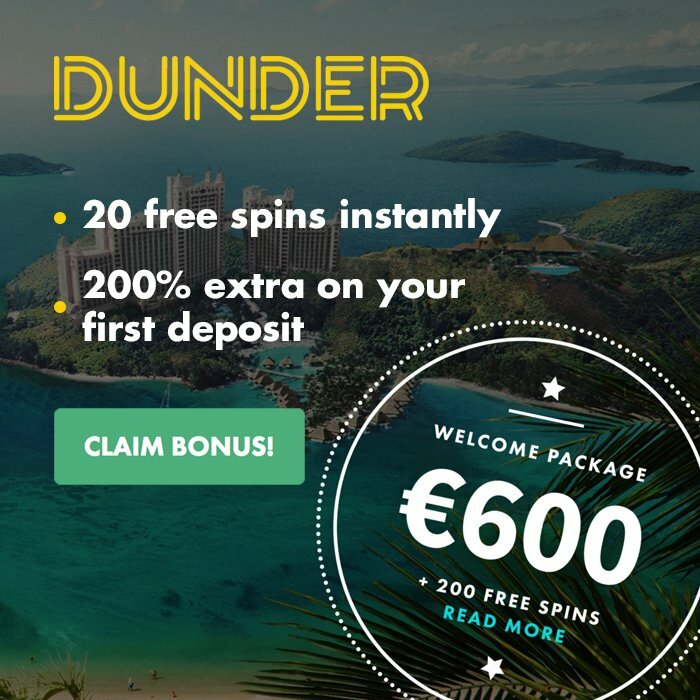 You can get up to £600 and 180 free spins on your first three deposits which means that the total amount of free spins at Dunder is 200. The first deposit bonus is a 200% one, up to £50. Depositing 25 quid will give you 75 to play with, which is just awesome! On your second deposit, you’ll get 50% extra up to £150 and on the third deposit there’s a 25% bonus up to £400 waiting for you. The 180 free spins will be credited after making your first deposit. However, these are credited in chunks of 20 per day for the upcoming 9 days and do not appear as a lump sum. All free spins are credited in the NetEnt favorite Starburst. The wagering requirement is low, at 25x, which means you have a great chance to win a nice chunk of cash! As mentioned, Dunder is on the iGaming Cloud platform and that enables them to offer a huge selection of games to their customers. Apart from classic games such as Starburst and Mega Fortune Dreams, you can also play new and exciting games from the likes of Yggdrasil, Play’n GO, NetEnt and IGT. With such a wide selection of games, it’s usually tricky to find your favorite games. That’s not the case on Dunder however, as they have created loads of interesting came categories which makes it easier for you to filter between different themes. Friday? Then you might want to go for the “party”-category of games which will definitely put you in the right mood. Other examples of game categories are “Mythology”, “Egypt”, “Fairy tales”, but that’s not all… you can also filter on different features within the slots. Whether you’re a big fan of cascading symbols, sticky wilds, re-spins or expanding wilds, Dunder Casino has got you covered and will help you find these games in a jiffy. An awesome welcome bonus: 200% and 200 free spins! For deposits at Dunder Casino, you can choose between multiple payment providers. Visa, MasterCard, Trustly, Skrill, Neteller, Euteller, EcoPayz and Paysafe are only the names of a few. No matter which deposit method you choose, your deposit will be credited instantly and you will be good to go straight away! Dunder Casino doesn’t cut down on anything, except the process time of your withdrawals which solely is a good thing! Once you’ve hit your big win in any of their 800+ slots, you will never have to wait longer than 24 hours to get your withdrawal processed and payed out to your account. A lot of customers are reporting that it goes much faster than that, though, with an average of 2-3 hours. Playing at Dunder Casino is smooth and hassle free, but if you need to contact the support team, they are available via email and live chat. The Chat is open daily, between 09-21. Outside of these hours, we recommend that you send an email to [email protected] and await a reply. We’ve tested the live chat on different occasions and hours, and we’ve always received fast and informative replies. It’s easy to tell that the person you are talking to is a casino enthusiast with experience in the area. Dunder Casino are pointing out that the customer experience is very important and you’ll notice that when speaking to them. Once you have settled in at Dunder Casino and used your welcome package, you’ll be treated as a a proper VIP. This new casino reward their existing players with new bonuses and different offers every week. If you play for higher amounts, you will probably be contacted by a personal VIP account manager who will take care of your account and make sure that you get to enjoy tailor made bonuses and other awesome perks that Dunder has to offer. When testing a new casino, it is important to do so on both mobile and tablet, and that’s exactly what we’ve done. We used an iPhone 6 and an iPad mini for the testing and we started with the most important part; registering an account. The process on both devices was very smooth, which is a key factor behind every successful new casino.